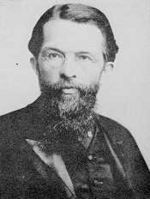 Carl Menger (February 28, 1840 – February 26, 1921) was the founder of the Austrian school of economics. His approach refuted the "labor theory" of value, showing that goods obtain their value neither from their intrinsic, objective worth nor from the effort (labor) required to produce them, but rather from their usefulness in satisfying human needs. This subjective component of value allowed him to explain the development of money as the medium of exchange, the establishment of price in trade, and laid the foundation for the theory of "marginal utility." Menger, however, did not believe economic relationships were purely subjective; on the contrary, he regarded the law of cause and effect as fundamental to all economic processes, inexorably linking human needs and desires with the value of goods that can satisfy them. This view, however, was not materialistic, as Menger's theories struck the heart of Marxist economics and socialism. Carl Menger was born in Nowy Sącz, Poland on February 28, 1840. He was the son of a wealthy family; his father, Anton, was a lawyer. After attending gymnasium he studied law at the universities of Prague and Vienna, and later received a doctorate in jurisprudence from the Jagiellonian University in Kraków. In 1867, Menger began a study of political economy, which culminated in 1871 with the publication of his Principles of Economics (Grundsätze der Volkswirtschaftslehre). At the time, Principles was largely ignored, although it later became the foundation of the Austrian school of economic thought. In the late 1870s, Menger tutored Archduke Rudolf von Habsburg, the Crown Prince of Austria, and later, in 1878, Rudolf's father, Emperor Franz Josef, appointed Menger to the chair of political economy at Vienna. In the late 1880s, Menger was appointed to head a commission to reform the Austrian monetary system. Menger died in 1921, almost 20 years after he resigned his professorship. I have devoted special attention to the investigation of the causal connections between economic phenomena involving products and the corresponding agents of production, not only for the purpose of establishing a price theory based upon reality and placing all price phenomena (including interest, wages, ground rent, etc.) together under one unified point of view, but also because of the important insights we thereby gain into many other economic processes heretofore completely misunderstood (1871). In his pioneering work, Menger re-developed classical economics because, instead of acknowledging "use value" (i.e. serving human wants) and "exchange value," the classical economists dropped “use value” (as given and as an unexplained precondition of "exchange value") from their analyses. In his theories, Menger reintroduced this concept. Menger easily recognized the profound significance of the concept of the "marginal unit"—the quantity of the goods relevant to choice—the knowledge of consumers, their wants, and the causal connection between goods for the whole of economic theory. Things that can be placed in a causal connection to the satisfaction of human needs are termed "useful." If, however, both this causal connection and having the power to actually direct the useful things to the satisfaction of one’s needs are recognized, they are called "goods" (Menger 1976: 55). People must possess correct foresight and knowledge concerning the means available to them for the attainment of their desired ends. They must have knowledge of the causal connections between goods with the characteristics that satisfy their wants and their future wants in order to carry out effective economic planning. These insights point to crucial issues in economics (Menger 1976: 89–92). For example, "goods of lowest order" are consumer goods, like bread for instance, which are used directly to satisfy human wants. In Menger's words, "the casual connection between bread and the satisfaction of one of our needs is…a direct one." Factors of production, on the other hand, are "goods of higher order," having only "an indirect causal connection with human needs." For example, flour and the service of ovens and the bakers' labor are second-order goods whose goods-character stems from the fact that, when they are combined in the process of production to yield a quantity of bread, they operate as an indirect cause of the satisfaction of the human want for bread. Likewise wheat, grain mills, and millers' labor constitute third-order goods, which attain their goods-character from their usefulness in the production of second-order goods. The same principle applies to fourth- and fifth-order goods in the production of bread. The process by which goods of higher order are progressively transformed into goods of lower order and by which these are directed finally to the satisfaction of human needs is…not irregular but subject, like all other processes of change, to the law of causality. It is their position in this causal order of want satisfaction that endows elements of the external world with their goods-character. If the value of goods is determined by the importance of the wants they satisfy, then the value of labor and other inputs of production (or "goods of a higher order") derives from their ability to produce these goods. Hence, the theory of production was simple enough: factors and intermediate goods ("goods of higher order") were demanded only because consumer goods ("goods of first order") were demanded. The subjective determination of consumption demands, Menger claimed, would, in turn, determine the demand for factors of production. The problem of "imputing" the value of factors from the subjective valuation of commodities (the exact reverse of classical theory) was to be a central concern of the later Austrian school of economics. Menger perceived immediately that the process of want satisfaction is not purely cognitive and internal to the human mind, but depends crucially upon the external world and, therefore, upon the "law of cause and effect." This explains why Menger began his economic treatise with the statement, "All things are subject to the law of cause and effect." However, the direction of causation is not one-way—from objective states of the world to subjective states of satisfaction. For Menger, it is two-way, because, by conceiving of the law of cause and effect, human beings are able to recognize their total dependence on the external world and transform the latter into a means to attain their ends. Man, thus becomes the ultimate cause—as well as the ultimate end—in the process of want satisfaction. Carl Menger has the twin distinction of being the founder of Austrian economics and cofounder of the marginal utility revolution. Menger worked separately from William Jevons and Leon Walras, reaching similar conclusions by a different method. Unlike Jevons, Menger did not believe that goods provide utils, or units of utility. Rather, he wrote, goods were valuable because they served various uses of differing importance. For example, the first pails of water are used to satisfy the most essential uses, and successive pails are used for less and less important purposes. Although water is essential for life it is also plentiful, with the result that the marginal value of water is rather low, much lower than, for example, that of diamonds and gold, whose relative scarcity ensures high marginal value. Menger used the marginal utility theory to refute classical economics' labor theory of value. Goods acquire their value, Menger showed, not because of the amount of labor used in producing them, but because of their ability to satisfy people's wants. Although he did not formally use the term "marginal," he did claim that people "rank-ordered" their needs and applied successive units of goods to satisfying less and less urgent needs. The "value" of a commodity, therefore, Menger claimed, would be the equal to the least urgent use to which it was applied. Only later did his disciple, Friedrich von Wieser, apply the term "diminishing marginal utility" to Menger's scheme. This limit (to exchange) is reached when one of the two bargainers has no further quantity of goods which is of less value to him than a quantity of another good at the disposal of the second bargainer who, at the same time, evaluates the two quantities of goods inversely. Menger's endeavor to radically reconstruct the theory of price on the basis of the law of marginal utility was not inspired by a vague subjectivism in outlook. Rather, Menger was motivated by the specific aim of establishing a causal link between the subjective values underlying the choices of consumers and the objective market prices used in the economic calculations of businessmen. Menger's ultimate goal was not to destroy classical economics, as has sometimes been suggested, but rather to complete and solidify the classical project by grounding the theory of price determination and monetary calculation in a general theory of human action. Menger's theory of the origin of money begins with the idea that valuation arises from the subjective perceptions of individuals and ends with money as an emerged social institution. Menger’s theory is an evolutionary explanation of a spontaneous process in which direct exchange via barter transforms into indirect trade with an institutionally established medium of exchange (Menger 1892). Menger argued that language, for example, developed for the same reason that money developed—to make interactions between people easier. He noted that neither language nor money was constructed by a government, calling such naturally occurring developments "organic." Menger also claimed that money is a measure of price rather than a measure of value. It is also the only commodity by which all other commodities can be evaluated directly, without using roundabout procedures. Menger explained that people will trade to obtain the goods they want to consume, and that they prefer to make the requisite trades as easily as possible. It follows that people will progressively learn to choose more and more marketable commodities to use in indirect exchange. As the number of desired media commodities dwindles, the demand for each of the remaining ones increases, making each of them more desirable as a medium of exchange. This narrowing process continues until the number of commodities used as a medium of exchange is reduced to one (or perhaps two) goods that are subjectively highly desired, and that can fulfill the minimal physical requirements of money. The commodity that is widely accepted eventually becomes money. Indeed, the word "pecuniary" derives from the Latin pecus, meaning cattle, which in some societies served as money. In other societies, salt, furs, shells, or stones served this function. As economies became more complex and wealthier, they began to use precious metals (gold, silver, and so on). Menger explained that gold was selected as a generally accepted medium of exchange because of its physical real essence and not by mere chance. Thus, the real essence of gold, based on its various properties, is at least partly responsible for its choice as a medium of exchange. Menger’s theory of the origin of money is thus a spontaneous social process, relying on the entrepreneurial and economizing actions of individuals. Human action begins a discovery process that results in the creation of the institution of money, an outcome that none of the actors intended. And again, money has not been generated by law. In its origin it is a "social," and not a "state" institution. Sanction by the authority of the state is a notion alien to it. On the other hand, however, by state recognition and state regulation, this social institution of money has been perfected and adjusted to the manifold and varying needs of an evolving commerce, just as customary rights have been perfected and adjusted by statute law (Menger 1892). Menger's explanation of how money developed continues to be accepted. Menger was the founder of the Austrian school of economics proper. He merits this title if for no other reason than that he created the system of value and price theory that constitutes the core of Austrian economic theory. But Menger did more than this; he also originated and consistently applied the correct, "praxeological" method for pursuing theoretical research in economics. Thus, in its method and core theory, Austrian economics always was, and will forever remain, Mengerian economics. Menger's greatest achievement and the essence of his "revolution" in economics was the demonstration that prices are no more and no less than the objective manifestation of causal processes purposefully initiated and directed to satisfying human wants. It is this price theory that is the heart of "Mengerian" and, therefore, of Austrian economics. What matters, therefore, is not the discovery that people buy, sell, or produce goods because and in so far as they value them from the point of view of satisfaction of needs, but a discovery of quite a different kind: the discovery that this simple fact and its sources in the laws of human needs are wholly sufficient to explain the basic facts about all complex phenomena of the modern exchange economy (Schumpeter 1969: 90). Menger's references to the division of knowledge, concerning causal connections between goods and wants, led directly to a devastating critique of socialism. Mises and Hayek used the ideas in Menger's (1871) book to prove that communal ownership of resources precludes rational economic planning. They argued that socialism prevents the effective use of knowledge concerning consumer demand—in Menger's words: the causal connection between goods with the characteristics that satisfy our (present) "wants" and the "future wants"—and the means of production, and that without real property rights we lack the communications network known as the free-market price system. Thus, under socialism, it is impossible to rationally calculate costs or efficiently allocate factors of production to their most needed tasks. Menger, Carl. 1883. Investigations into the Method of the Social Sciences: with special reference to economics. Menger, Carl. 1888. Zur Theorie des Kapitals. JNS. Menger, Carl. 1889. "Nationalökonomische Literatur in Österreich" in Wiener Zeitung. Menger, Carl. 1889. Toward a Systematic Classification of the Economic Sciences. Menger, Carl. 1891. "Die Social-Theorien der classischen National-Ökonomie und die moderne Wirthshaftspolitik" in Neue Freie Presse. Menger, Carl. 1892. "On the Origins of Money" in Economic Journal 2: 239–55. Menger, Carl. 1871 . Principles of Economics (orig: the Grundsätze). New York University Press. Menger, Carl. 1985. Investigations into the Method of the Social Sciences with Special Reference to Economics. New York University Press. Salerno, Joseph T. 1987. "The Neglect of the French Liberal School in Anglo-American Economics: A Critique of Received Explanations." The Review of Austrian Economics 2:113–56. Schumpeter, Joseph A. 1969. Ten Great Economists: From Marx to Keynes. New York: Oxford University Press. Yagi, Kiichiro. 1993. "Menger's Grundsatze in the Making." History of Political Economy 25:697–724. Principles of Economics – online version provided by the Ludwig von Mises Institute. This page was last modified on 11 January 2017, at 16:44.